Sometimes though, people in business make communication mistakes which mean that they, their business’s reputation and their teams are less than happy. Take for example the classic example of Shell and Greenpeace over the disposal of Brent Spar. The science was on Shell’s side but the company’s handling of this crisis and its communication plan dented its global reputation as well as Greenpeace lost credibility. 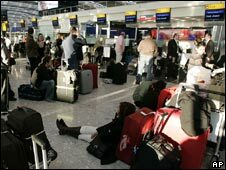 The opening of Heathrow Terminal 5 was not only an operational disaster but also a communications flop with a member of staff shutting a door in the face of a BBC TV crew. Gerald Ratner wiped an estimated £500m off his jewellery company after he proclaimed that Ratners “sold a pair of earrings for under a pound, which is cheaper than a prawn sandwich from Marks & Spencer, but probably wouldn’t last as long” and let everyone at the Institute of Directors know that the tacky sherry decanter he sold was so cheap because it was “total crap”. Other examples of business people not connecting their communication dots include then Barclays chief executive Matt Barrett who told the Commons’ Treasury Select Committee that he did not use credit cards from his own subsidiary and the UK’s largest credit card company, Barclaycard, because it was too expensive. Bastion of the UK the BBC is still reeling from the reputational crisis that is Savilegate and the repercussions will no doubt keep pouring forth in 2013. Habitat, the trendy furniture store, decided to use trending topics to get noticed but they used ones that had nothing to do with their business but rather were ones that were trending at the time. At the start of 2012 McDonald’s #McDStories hashtag backfired when instead of offering positive comments about meals, users began flooding the tag with horror stories. One of the Twitter disasters of the end of 2011 was Qantas who opened up their promotional hashtag #QantasLuxury at a time when thousands of passengers were stranded overseas. Be happy in 2013, join the dots before you communicate.